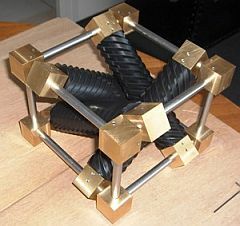 Lattice unit cell packs four worm wheels in such a way that each worm wheel propels the other three; the lattice unit is square-based with smaller faces. 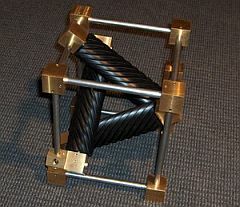 Lattice unit cell packs three worm wheels in such a way that each worm wheel propels the other two; the lattice unit is square-based with larger faces. Octahedral unit cell packs twelve vortex tubes as worm wheels in six quadruplets and eight triplets that propel each other in a vortex lattice. Sphere packs twelve vortex rings as worm gear with six quadruplets and eight triplets that propel each other. By decreasing diameter towards the centre circulation speed increases as in a tornado.